Officials on Wednesday said they had agreed to their request on the condition that it did not interfere with the visit of Chinese President Xi Jinping. After a two-hour meeting with a committee attempting to hold a public ceremony to mark 100 days since the political analyst Kem Ley was gunned down in Phnom Penh, officials on Wednesday said they had agreed to their request on the condition that it did not interfere with the visit of Chinese President Xi Jinping. Mean Chanyada, a City Hall spokesman, said prior reports that Phnom Penh had denied the group’s request were exaggerated. 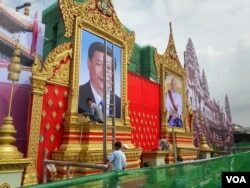 The ceremony is due to take place between Thursday and Sunday, which will coincide with the much-anticipated arrival of Xi to the city, where he is due to sign a number of trade agreements with Prime Minister Hun Sen.
Pa Nguon Teang, a representative of the committee, said permission was granted after the group told city officials that there would not be any demonstrations and that the event would be purely religious in nature. During the ceremony, visitors to Wat Chas pagoda, where the ceremony will be held, an exhibition of photos and examples of Ley’s work will be on display. Ley, an outspoken critic of official malfeasance and abuse of power, was shot dead in Phnom Penh on July 10 in a killing widely believed to be politically motivated. Ley’s family is now exiled themselves to abroad for the security reason.